Following Floyd Mayweather’s first-round decimation of Tenshin Nasukawa at Rizin 14, Oscar De La Hoya feels the time is near for a rematch between Mayweather and Canelo Alvarez. 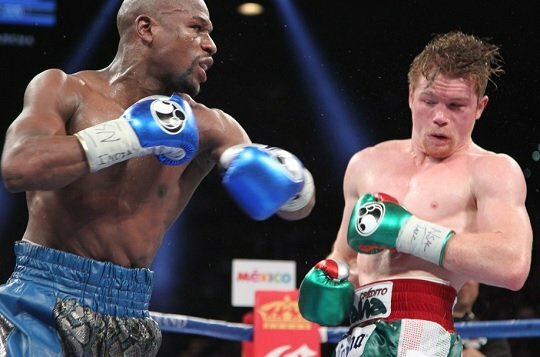 The two faced off in 2013, when a 23-year old Alvarez faced Mayweather at a catch-weight of 152-pounds, with Mayweather handing Alvarez a unanimous decision loss. “I think so (the fight can happen) if Mayweather wants the money so much, it’s a real fight,” De La Hoya said of a rematch to A Los Golpes. What would stand in the way aside from money and the bitter feud between Mayweather and De La Hoya is weight. Mayweather has never fought above 154 pounds, while Alvarez has moved up in weight to take the WBA super middleweight title from Rocky Fielding in December. If Mayweather was willing to move up to 160 pounds, De La Hoya feels his fighter would get the victory. “Yes, without a doubt [he would beat Mayweather], with a strategy behind the jab, with throwing a lot of combinations, using angles, applying pressure on him like [Julio Cesar] Chavez – and that’s how he would defeat him,” De La Hoya said.